The Ebac AD850E combines powerful performance and rugged construction with a stylish appearance. It removes moisture from the air at a rate of 87 pints per day at 80°F and 60% relative humidity and up to 160 pints at saturation. It is designed for use in public and working environments and existing customers are using this unit in locations as diverse as offices, museums, hotels, restaurants, telecommunication and computer rooms. 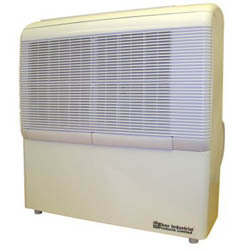 The manufacturer recommends this dehumidifier for spaces of up to 1700 sq ft. The Ebac AD850E is designed for commercial applications where a stylish unit that blends into its environment is preferable. With that in mind Ebac have cloaked this tough machine in a streamlined off-white cabinet with gently rounded angles, both safer and more pleasing to the eye for users of the space where the unit is installed. The softer appearance of this dehumidifier belies its tough and high quality components, including a high-efficiency rotary compressor, which are assembled together to create a powerful, durable and reliable machine more than capable of its heavy duty task. Despite the robust engineering the Ebac AD850E is pleasingly quiet ,due to the use of a cross-flow blower, with a maximum noise level of only 50db. The Ebac AD850E comes with two options for installation. It can be placed at a convenient point as a free-standing unit or, to preserve floor space and to make it less accessible to customers, especially younger ones, it may be wall-mounted. Although the locations where this unit is typically used tend to be a little less demanding than some industrial sites they can become cool, especially when not in use. The AD850E has an automatic defrost feature which makes this unit suitable for low temperature operation down to a minimum of 41°F. If controlling humidity 24/7 is important this feature ensures that the AD850E can do it. The AD850E also incorporates an adjustable humidistat. This device allows a preferred level of relative humidity to be selected and the humidistat then controls operation of the dehumidifier to maintain the pre-set level. By cycling the unit on and off as required, rather than operating continuously, energy is saved and costs reduced. Minimising fluctuations in relative humidity is another benefit which may be of particular advantage in certain locations, such as a museum. Disposal of the condensate is also taken care of as the AD850E is designed for continuous drainage. There is no difficulty if the nearest drain is at a higher level than the dehumidifier as Ebac have installed an internal condensate pump in this unit to provide a convenient and tidy means of disposing of the water. The AD850E is easy to operate with electronic soft touch controls, to set the humidity level and preferred fan speed, and a digital display clearly showing your programmed settings. The unit is also equipped with two washable air filters, for improved air quality, and is energy efficient to minimise costs. If you have little or no experience with dehumidifiers a word about water extraction rates may be helpful. The Ebac AD850E will extract 87 pints per day at 80°F and 60% relative humidity. The temperature and relative humidity levels are quoted because water extraction by any dehumidifier is dependent on these two variables and will fall as temperature and/or relative humidity fall. A lesser extraction rate at lower temperature or relative humidity need not indicate a malfunction in the unit.